Real grass is great. It’s comfortable to sit on, easy to play on and ideal for sports. However, it has its drawbacks and for schools that like grass surfaces, artificial grass provides the same benefits but without any of the issues that grass causes. Need convincing? Then read on and we’ll explain why, for schools, artificial grass is better. While we all love the smell of freshly cut grass, no-one likes it better than the company that gets paid to cut it. And grass needs cutting regularly, particularly in spring and summer and especially if you need it keeping short to play sports on. Besides regular mowing, there’s also a need for regular maintenance. With hundreds of children running all over it every day, real grass gets worn away. You’ll find bare patches and unplanned footpaths appearing in the areas that are most heavily used. On top of that, there are issues caused by moss, weeds and periods of drought which can cause the grass to die off and need reseeding. All of this maintenance can be expensive. Indeed, if mega-rich sports clubs have shifted to artificial grass because the natural variety is costly to maintain, then it’s certainly something that cash-strapped schools could benefit from. Artificial grass doesn’t need cutting and is made from highly durable materials that last for years. Unlike natural grass, which gets worn away, it is designed for regular, heavy use. One of the big issues with real grass is that it needs soil to grow in. When soil mixes with rain and gets churned up by all those feet, the result is mud. Mud, unfortunately, gets everywhere. It sticks to children’s shoes and they trample it all through the school where it dries and forms a layer of dirt that blankets everything. That sparkling corridor that the cleaner polished the night before looks like it hasn’t seen water in years by the end of morning break. The result of mud is children’s clothes getting dirty, PE lessons having to finish early so pupils can get cleaned up and the expense of having to clean the floors so regularly. Without mud, floors take less time to clean and this means schools could reduce cleaning costs over the year. The advantage of artificial grass is that there is a self-draining barrier between the surface and the soil underneath which prevents mud from being formed; as a result, your school and your pupils will be cleaner. The other disadvantage of mud is that it prevents children from playing on the grass after a downpour. Not only do the children get muddy feet but they are also liable to slip and injure themselves. Muddy pitches also put a stop to many PE activities, forcing teachers to abandon their plans and seek indoor alternatives, which isn’t good when they have a scheme of work to complete and there’s a shortage of available indoor space. With artificial grass, this doesn’t need to happen. The lack of soil means It doesn’t get muddy, its self-draining properties prevent pools from forming and because it’s laid over an impact-absorbing layer, it doesn’t freeze rock solid in winter. Not only does this mean schools can get much more use out of artificial grass surfacing than from real grass; it also ensures that the surface is always usable, enabling them to stick to their plans, come rain or shine. Artificial grass is safer than real grass in a number of ways. One way is that it reduces allergies. Quite a few people have grass allergies, some are allergic to its pollen, others develop rashes just by touching it and there are those that are allergic to the moulds which are dispersed when grass is cut. Replacing real grass with artificial grass eradicates the causes of these allergic reactions. 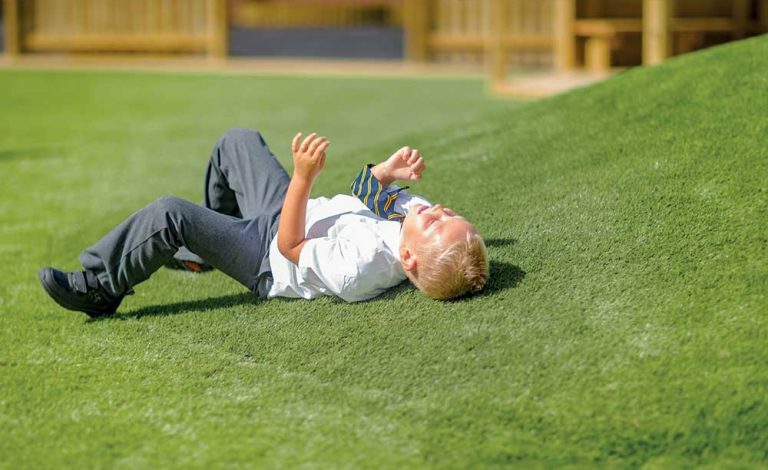 As artificial grass has an impact-absorbing underlayer, it also reduces the chances of children being seriously injured if they fall or slip when at play. This makes it great as a surface onto which you can install other outdoor play equipment, such as climbing frames and Trim Trail obstacle courses. The protective layer also prevents sharp stones or bits of glass that have been buried in the soil rising to the surface where they have the potential to cause injury. And if a pupil does have a cut or scrape, there won’t be any soil getting into the wound, reducing the chance of infection. As a school, you always want your outdoor spaces to look inviting for your pupils to play on. While natural grass can look fantastic when it’s in good condition and has been recently trimmed, its appeal can waver. It can turn brown, grow mossy, develop bald-patches, become unkempt and look like a wet weekend at Glastonbury Festival. 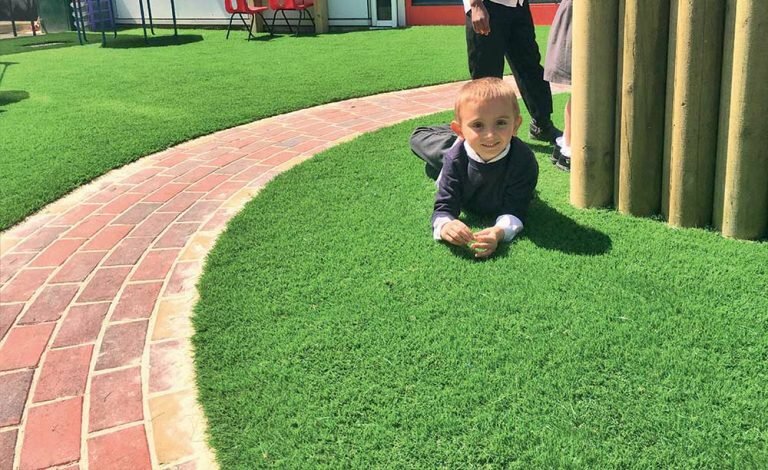 Artificial grass keeps its looks all year round, perfectly green and immaculately trimmed, making it look inviting for the children and appealing to visitors. As you can see, while there are lots of reasons to love real grass, if you are a school, artificial grass might be more of a fit. It’s cheaper to maintain, cleaner and safer. What’s more, it can be used in all weathers and looks great all year round. For more information about our range of artificial grass surfaces, check out our artificial grass page.